The whole family is gnawing-on-our-nails worried about Bruiser. 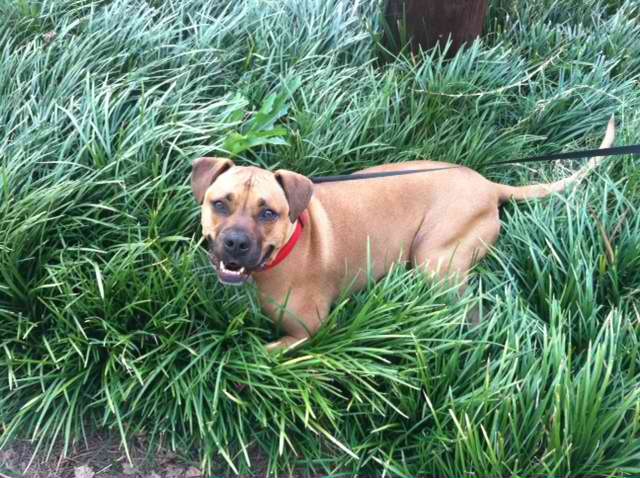 My daughter’s adorable 70+ pound Boxer mix rescue is scheduled for surgery on Wednesday. Both of Bruiser’s back legs, the equivalent of human knees, have torn ACLs. The left one which will be operated on this week also has a torn meniscus and the beginnings of arthritis. It is gut-wrenching to hear his leg click when he tries to run and play. When Laura adopted Bruiser three years ago, we discovered on his first trip to the vet that he had a serious case of heartworms that needed immediate treatment. Everyone kicked in cash to treat him, which gave us all an interest in the boy. He’s almost five years old now and has become a beloved member of our family – a guard and companion for Laura, a gentle pet for my mother, and a feisty challenge for the rest of us. Thought I’d document his treatment and recovery in pics over the next few months because I’ll be caring for him most of the time. Since Laura’s home has stairs and she works long hours, Bruiser will live at my house. Mama and I are moving into the basement, so that he can access our yard as needed. Unfortunately, he will be crated part of the time because he will be unable to walk for a while. More on that another day. Check out the picture of Bruiser from last weekend. This was his last long walk with Laura in Inman Park (downtown Atlanta) before his surgery tomorrow. True happiness for him is plopping down on the ground and rolling in the grass.